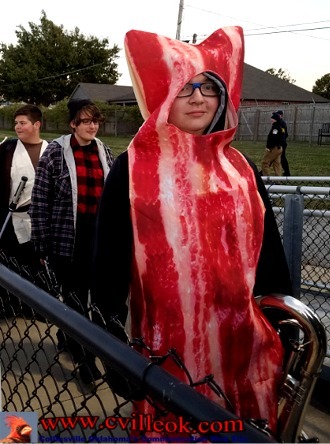 The Collinsville Crimson Cadet band relaxed a bit with Halloween costumes Friday at Claremore after a busy and successful previous few weeks including being OBA runners-up, regional champs at BOA in St. Louis and all I's at OSSAA. Behind a wall formed by the offensive line the backs kept Claremore guessing who had the ball. 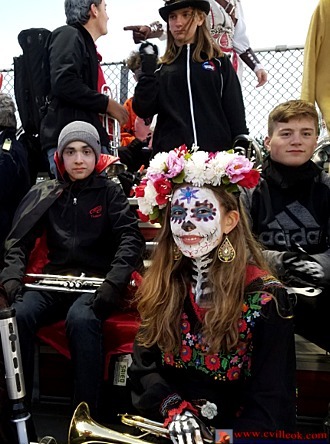 The defenses kept the game scoreless for about a quarter and a half before Claremore struck with a 46 yard TD pass at 6:52 in the 2nd quarter. Brayden Burd (#22) brought the ensuing kickoff out to the Cards 41 to set up a matching Cardinal scoring drive. Hayden West (#33) took a pass from Carson Stout and covered 30 yards for the initial Cardinal points with 3:33 left before half time. Ashton Jones kicked the extra point to tie the score at 7 each. Collinsville had a couple of changes to add a score just before half time but two pass attempts from the 30 yard line to Grayson Boomer (#18) did not connect as time expired. 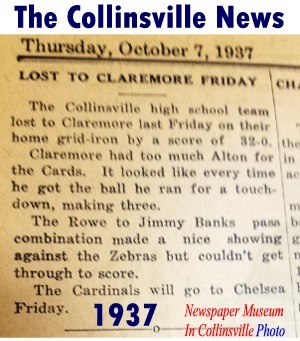 Collinsville kicked off to Claremore to start the 3rd quarter and that first possession ended with Claremore's punter unable to get the handle on a low snap and Collinsville got a gift, taking over at Claremore's 29. From the 29, Collinsville got to the 2 yard line but settled for a Seth Weiser (#6) field goal at 5:10 in the 3rd quarter and a 10-7 lead. Collinsville's lead didn't last long as Claremore provided just enough protection to complete a 76 yard touchdown pass just 3 plays later and go up 10-14 at 4:18 in the 3rd quarter. Collinsville answered with a West kickoff return to the 47 followed by Tuttle and Stout carries down within inches of the goal before Carson Stout (#2) kept to the right for a touchdown to put Collinsville back on top at 16-14. Jones' kick made it 17-16 with no time left in the 3rd quarter. Collinsville scored again at 9:21 in the 4th quarter on a 33 yard scamper by QB Carson Stout (#2). The score was 24-14 after Jones' PAT kick. The Cardinal offense and defense finished out the game with enough first downs and stops (and a missed Claremore field goal) to hold on for their fourth straight district win. 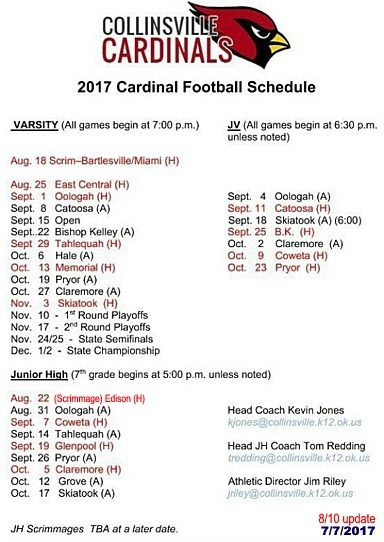 District champ Skiatook is the remaining challenge on the regular season schedule (also Senior Nite Nov.3rd). Tres Sexton (#59) stopped the final Claremore pass attempt batting this final 4th down attempt striaght up to help seal the Cardinal road win.